Hey folks, Ive been doing some listening to mid air refueling the USAF does over NS, its very interesting, it seems they are up there most every day at some point..anyways, just thought I would share these freqs for anyone else who might want to listen in, this info is also posted on Marscan, but its hard to read so I decided to post it here ...maybe this is posted in another forum here, and I just didnt see it, but here goes anyways. If nothing else this will save someone squinting at that sheet for 20 mins to get all the freqs The names I used are pretty simple, and fit in my uniden nicely, but heres a little reference just so its clear if you use them yourself..
Exit : end of fueling track, report back to designated control center. I hope this is usefull for some people out there, and maybe we get some discussion related to this stuff for our area, I was also thinking it would be nice to have a list ready for the Air show since its back this year, last I heard. How old is that map? I have a map that has been revised Feb,2009 that indicates AR-020 Primary tanker freq is 341.750 and 349.700 is Secondary Freq. I can post the map but Im not sure how to attach pictures to posts here. If you could give me some pointers I will post it. It has all the tanker refueling tracks and anchor points in the mid Atlantic to NS. Had to do a little test as Ive never posted a pic here,lol, All you have to do, is click "Go Advanced" instead of quick reply, then you can scroll down to the "Manage Attachments" button, click that, then the window will open up to select what you want to attach, click Browse, and find the image on your computer, select the image, and click ok. Then click upload. complete you post and click Submit on your post..it should show up for you like mine did below..
As for the age of these pics, I couldnt tell you, i just found them on Marscan, and some of the freqs seem to work. Nice one N1RGR, Thanks! Do you have the map over Nova Scotia by chance, or a link to the page you found this one ? I'm listening to AR-020 right now, someone just said they have someone in sight, which I assume means they're forming up to tank. And it's cloudy. Grrrr!!! Thanks for the frequencies! I heard them as well, didnt catch the tail #s or anything tho, was away from the desk, sounded like they had to break off once, and reconnect. Wonder where they were. I've moved the frequencies to the same scanlist as my police stuff so it's always on. I'm an airplane FFFFFFfffreak, so it's great to be able to hear this stuff on my new PSR-500 after missing out on it for years. 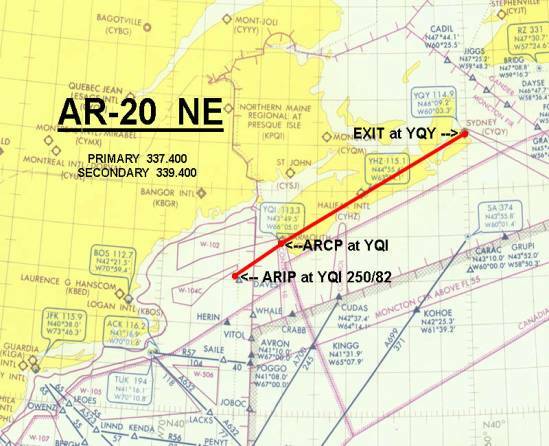 They probally havent changed the route even if the document I got it from is outdated, as it is based on the VOR's(VHF omnidirectional radio range) at Digby, Halifax, and Sydney Airports, which haven't moved I dont think.. Thanks! So they never stray very far from that course huh, that's great, it makes them easier to spot. Although I've been into planes since I was a kid, and therefore have always looked up when stuff going over has caught my eye, I've only ever seen IFR twice that I can remember. Last summer I caught a C-5/KC-135 going over my parents house, it was great. I was kicking myself for not bringing my camera, and then as a final insult they disconnected right over my head, with crazy vapor coming off the leading edges of the Galaxy's wings. I'm still a little upset about it since I debated bringing my camera to their place that day. Another site that might interest people is : Aircraft Serial Number Search , if you can catch the tail numbers, you can do a search to find out what they are, and they usually exchange tail numbers before or after they do the fueling.. They exchange tail no.s? I saw that mentioned the other day in this thread and meant to ask if they actually do that. That's awesome, that way we can confirm what we're hearing. Can be hard to tell an F-15C from an F-15E at angels 30.. Where are you at anyway, NE1C4NSC4N? I'm in Clayton Park, hoping the view is good from there. I can see sightings going way up for me now that I have my "tanking detector" on all the time. Something else - I've added AR-020 primary and Secondary to my police scanlist, as I may have mentioned, is this where the majority of the talking is? I assume the other freqs posted here are either too far away from Halifax or too little used to bother, is this correct? From my experience, they mainly just use the primary or secondary, and then the channels for each control center, so Gander, Moncton, and Boston. Usually they do a quick check in with each control center, and get nav info for the route they will take after fueling. The thing I notice, and dislike, is that civilian planes use the control center channels as well, and it can be very noisy during certain hours with boring check in's for high level aircraft, which may cause you to miss the chatter on the Pri/Sec channels. I have locked out the civilian channels, and just scan the Pri, Sec, and some other MilAir Freqs I found..above 225Mhz. If you want to hear the civilian stuff to, you should be able too, and depending on what you have for an Antenna setup, you should hear MCC and you should also hear one side of the conversation, when they switch over to BCC or GCC, from Moncton. I live in the Hammonds Plains area, and am lucky to live near the top of one of the higher hills in the area(90M ASL), so maybe I catch more then someone in the city would..
if you use Google Earth, you can find your elevation if your curious, as well you can upload that map of AR-20 I linked above into google earth, and get a better idea of where they will be in relation to your home. hey guys, great to see some others making use of this stuff...its great fun listening, some of them chat it up a bit and give more details like their home base or unit. i love to get out with the binoculars when i can, one day last week, or maybe 2 weeks ago now, I saw what looked to be a C17, connected to a KC135, it made the KC look like a little CRJ like Air Jazz fly lol, such a big difference in size.. Does anyone know of a Google or other app/photo that displays all the VORs? I see a bunch (WHALE, CRABB, etc.) on that map, I'd like to have a way of looking more up when the mood strikes. Thanks in advance! Tanker's have to keep a record by tail # of each A/C they refuel. Receiver's have to keep a record of who refueled them. Those are not VORs, just waypoints on the map.